← WHAT ARE FINE MOTOR SKILLS ? Baby Rattle Options, from 2-3 months (far left) to 8+ months (far right). One of the most popular baby shower gifts is a baby rattle. They come in all shapes, sizes, materials, colors, weights, and sounds. Why? Because these varying features of the rattles are extremely important for the development of a baby. Previously, we discussed the importance of sound variations in rattles. This post is about the importance of the diameter and material of the handle on the baby rattle. At the age of two or three months it is fairly easy to introduce baby to a rattle. At that age her hand and fingers are so tiny that she needs a baby rattle with a tiny diameter to hold on to. The rattle should fit like a stick, very deep in the palm of her hand. Many mothers-to-be receive rattles as baby shower gifts there are far too large for baby to hold onto until she is close to one year old. The above photo illustrates the available range in handle diameters. The diameter of the rattle handles in the above photo are about 1/4 ” (first three from the left), 1/2 ” (fourth and fifth from the left), and 3/4″ (far right). The younger babies benefit from the rattles with the smaller diameter for the first few of months, eventually adding to their rattle collection some bigger rattles with larger diameter handles. 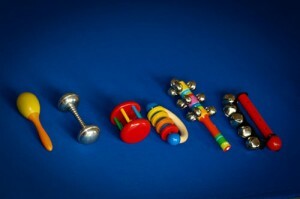 The material of the baby rattle is important for developing proprioception of the hand and fingers. The firmness of the material gives baby a clearer feeling of her hand and fingers. When she feels them clearly she can use them more easily. The silver and pewter rattles have more weight to them which also develops strength. Plush rattles are too soft for developing the proprioception deep in the palm of the hand, but can be a nice addition to a collection of baby rattles since they provide a different tactile experience. By giving baby a rattle which she can hold onto easily, it makes it possible for her to play with it. Rattles are important for fine motor skill development, and she needs to be able to shake the toy, take it to her mouth, transfer it from one hand to the other, let go of it and pick it up again. This exploration develops hand-eye coordination and manual dexterity, the building blocks of her future in school and on the playground. This entry was posted in FIVE SENSES, RATTLES and tagged 3-6 months, 6-9 months, curiosity, newborn, play, touch. Bookmark the permalink. Hi Jeanine: Thanks for your comment. I do all of the writing myself for the posts. If you are looking for a marketing writer, consult your local business school and ask for some referrals. You can also contact the Small Business Admin. for suggestions. Good Luck! These are our favorite rattles! We look forward to playing with them every week when Donna visits!